Tasted non blind. Opened and served immediately. Followed over two hours. Joel & Duncan Gott took over the Taylor’s Refresher location from the Taylors in 1999. Taylor’s Refresher has been an institution in Napa Valley practically since it opened back in 1949. 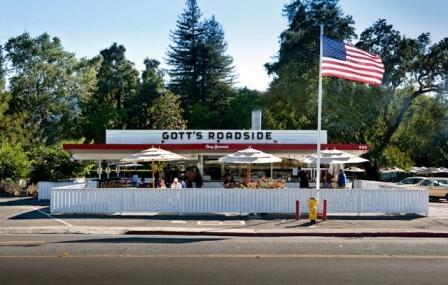 The Gotts recently changed the name to Gott’s Roadside Tray Gourmet (causing a bit of a tussle with the Taylors and long time followers alike in the process) but the old Taylor’s Refresher sign remains on Highway 29 silently calling us in for a quick bite to eat as it has for years and years gone by. We visited the now Gott’s for a quick bite to eat on a Sunday afternoon between scheduled winery appointments. I had the Bacon Cheeseburger ($8.99) consisting of American Cheese, bacon, lettuce, tomatoes, pickles and secret sauce set on top of an egg bun. This solid burger offering is all about a good sized, good quality, dense beef patty set atop a fresh and distinctive egg bun. The bacon and cheese naturally seal the deal for a guy that hates his cardiologist. Their burgers are an ideal way to fortify you for the winery tastings to come. I naturally had to accompany that with my usual order of Garlic Fries ($3.99) consisting of crispy “always eat them while their hot” thin cut French fries tossed in a heavy dose of garlic and parsley flakes. You’ll love them while they’re hot but afterwards nobody will want to be around you. That’s a small price to pay in my book in order to eat these yummy fries. Of course the only way to wash down Gott’s Garlic Fries is with one of their handmade shakes ($5.99) so on this occasion I opted for my personal favorite chocolate. It is always a tough choice while standing in line: Chocolate? Black & White? Expresso Bean? You get the picture. For her entree Cynthia went with the Fish Tacos ($12.99) consisting of fresh Mahi Mahi that was moist, tender and flavorful wrapped in a fresh (yes it was fresh) corn tortilla topped with what Gott’s calls a Mexican slaw, salsa, cilantro and sour cream. The taco was very fresh and flavorful, definitely a recommended alternative to the normally go to Gott’s burgers and fries. We’ll chat about the Ahi Burger in a future review (try it some time, you’ll love it). Since the Gott’s took over the St. Helena location they’ve expanded the concept to additional locations in the Oxbow Market in Napa and the Ferry Building in San Francisco. We’ve previously eaten at the location in San Francisco and we can say with a certain amount of surety that the formula so far is carrying well to other locations without the original namesake suffering any ill effects. Gott’s is as casual as it gets so dress in whatever makes you comfortable. Parking is free if you can find it in the surrounding lots. Be warned that lines (you stand in line to place your order until your name is called to pick up your food at another window) can get very long at peak times such as Fridays and Saturdays around the Noon hour so allow ample time accordingly. Major credit cards are accepted which is helpful given the pricey nature of their offerings. Gott’s: the name has changed but in our book it is still recommended.